The title of this post refers, of course, to the song “Do-Re-Mi” by Woody Guthrie — which is perfectly apt, since Woody’s buddy Pete Seeger is lending his voice to a campaign to raise money for the trailblazing Sing Out! magazine, which has hit a fiscal sour note as it marks its 60th year of publication. Visited Saratoga Springs this weekend with my son. On Saturday night, we stopped by the famous Caffe Lena on Phila Street in Saratoga Springs, which I’m assuming isn’t much different than the way it was when it opened more than forty years ago — it certainly had that feel. We heard a performance by singer/guitarist Laura Vechionne. We drank coffee and tea. And we checked out the walls, which are filled with an impressive array of photos of the likes of Arlo Guthrie, Dave van Ronk, Nanci Griffith, Don McLean, Ani DiFranco….and scores of others, including very young Bob Dylan. 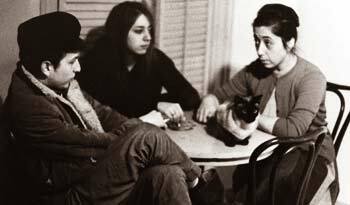 Bob Dylan, Suze Rotolo and Lena Spencer sit at a table in Caffe Lena. The photo was taken in 1961 by Joe Alper. Speaking of Caffe Lena, good friend and very good novelist Christian Bauman performed there in his previous incarnation as a very good singer/songwriter/guitarist. There’s a link to his Web site listed on this page under friends. Chris sometimes share some tidbits from his traveling folkie days — like the time he dueted with Pete Seeger on a Woody Guthrie song — and those days even inspired his most recent novel, In Hoboken. Speaking of Bob Dylan and Saratoga Springs, it just so happened that His Bobness was performing on Sunday in that very town — and my guitarist/Dylan fan son and I just happened to have orchestra tickets for the daylong music festival held at the Saratoga Performing Arts Center. Well, not quite, since it was only mid-November, and right around then winter was bearing down hard on Niagara Falls, New York, but it was warm enough that — fortified by strong alcohol and a strong sense of destiny — that my friend Phil and I set up camp that night outside the Niagara Falls Convention Center and waited to buy tickets in the morning for a show the next night by Bob Dylan’s Rolling Thunder Revue. We were so young. I remember thinking that it was amazing that Dylan was out on the road again, performing again, at the ripe old age of…what, I guess ol’ Bob was about 35 years old! Friend Phil recalls this: I remember clearly the rendition of “Tangled Up In Blue’, when he changed the lyric “Some are carpenters’ wives” to “Some are truck drivers’ wives”. Me, I remember that the most impressive and thrilling songs were the songs from the new album “Desire” — “Romance in Durango,” “Oh Sister,” “Hurricane,” “One More Cup of Coffee” and “Sara”; the powerful symbolism of Dylan and his merry band doing a finale of “This Land Is Your Land” in tribute to Woody Guthrie and with a nod toward the upcoming bicentennial (as an idiot wind blew from the Grand Coulee Dam to the Capitol…); and, I believe, a duet with none-other-than Joan Baez on “Mama you’ve Been On My Mind.” I remember being in a bar in Niagara Falls when a girl I knew ran in and excitedly handed me a handbill she’d just been handed by some guy on the street — a handbill for the Rolling Thunder Revue. I remember that a girl named Lee — blonde and beautiful Lee — came with me to the concert, to which I wore a stupid black fedora, which fedora Lee decided sometime during that evening to wear over her long golden locks, and I never saw that fedora again. As I recall, we had great seats in the middle orchestra, no more than ten rows back from the stage. I have a vivid image of Dylan wearing that clear plastic mask and a hat just like the hat he wears on the cover of “Desire” and he’s standing at the microphone without his guitar doing a sort of hipster pantomine as he sings “Isis.” I remember falling in love, alternately, with Joni Mitchell, Roni Blakely and Scarlet Rivera. I remember that the show opened with a song by Ramblin’ Jack Elliot, who was dressed very much like Dylan and looked very much like Dylan and until he started singing many people in the audience were cheering because they mistakenly thought he WAS Bob Dylan.